Affiliate linksWhen it comes to skincare woes, acne pretty much tops the list. As someone with acne-prone skin, I’m always on the lookout for the best solutions to banish breakouts once and for all. Dealing with acne doesn’t get any easier with age. Those of us with adult acne know how frustrating it is to tackle breakouts and fine lines at the same time! And we have to be extra careful about the products we use in our skincare routine, be it a serum, face mask or moisturizer. Serums are skincare superheroes that can tackle almost every aging concern from sun damage to fine lines and everything in between. But figuring out which serum is right for acne-prone skin isn’t always easy. Not to mention, some of the potent serums come with a hefty price-tag because they are packed with high concentrations of active ingredients. But not all hope (or money) is lost! 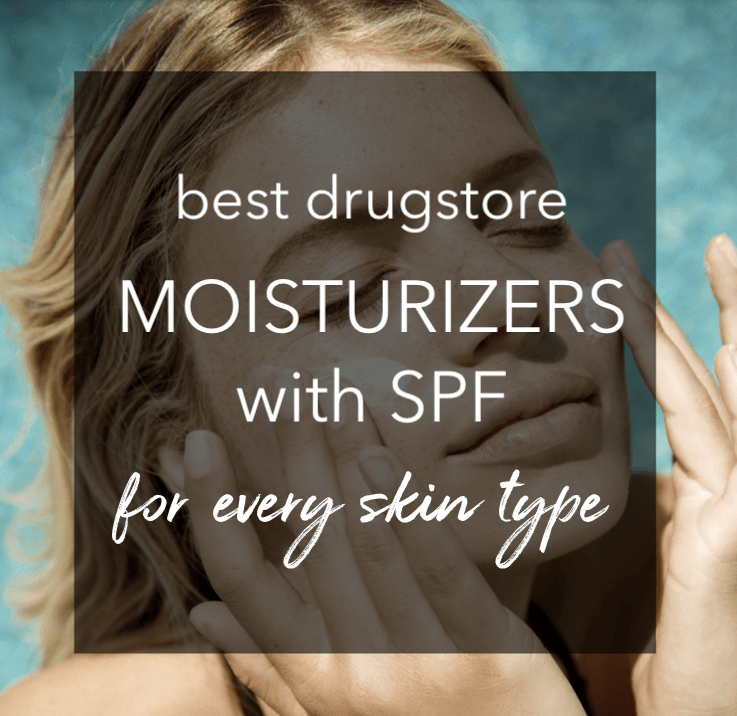 Today I am talking about the best drugstore serums that deliver serious skin-saving benefits, without making acne-prone skin cringe! These gentle and affordable skin-smoothing serums won’t clog your pores or feel heavy/greasy but will help soothe & calm your complexion, while improving the clarity and texture of your skin. As the name suggests, this serum works while you sleep to exfoliate and soothe your skin for a brighter complexion. Formulated with 10% glycolic acid plus Vitamins A, C and E, it helps to reduce the appearance of fine lines and fade sun spots over time. Cucumber & aloe vera are extracts are also included to calm skin. In addition to improving uneven skin tone and texture, Alpha Hydroxy Acids (like glycolic acid) pack a punch against acne, too. AHAs work well for acne-prone skin since they don’t scrub away at and irritate acne like mechanical exfoliators (scrubs, brushes, etc) do. Infused with Vitamin C, Niacinamide and Retinol, this correcting serum diminishes post-acne scars/dark marks and evens your skin tone for a more refined texture. The multi-tasking formula also contains several other good-for-your-skin ingredients like Vitamins A, B, E and fruit seed extracts. If bumpy skin or texture is one of your skin concerns, this lightweight serum can be a worthwhile addition to your skincare routine. It leaves a clean-feeling, matte finish and layers easily under makeup. If you are struggling with hyperpigmentation in the form of dark spots, discoloration and fine lines, this super-charged serum with 14% glycolic acid would be a great solution for your skincare grievances! Best used at night, this water-like serum not only exfoliates and brightens skin, but also keeps acne breakouts under control! However, keep in mind that 14% glycolic acid might be too much for your skin daily, so it should only be used two to three nights a week. Just don’t forget to apply sunscreen every morning so you don’t see those spots return! Great for anyone with oily, acne-prone skin, this product combines a high 10% concentration of niacinamide (Vitamin B3) to reduce the appearance of blemishes and enlarged pores along with 1% Zinc PCA to balance sebum (oil) activity. If traditional blemish treatments haven’t worked well for your troubled skin, this niacinamide based formula might just do the trick for you! This product is vegan, cruelty-free, and formulated without alcohol, silicone and fragrance. Make it a part of your daily morning and evening routine—the silky, weightless gel texture layers easily under your moisturizer. Niacinamide is also known to be an effective ingredient for brightening skin tone and helps soothes redness too…what’s not to love! Note: If you also use a Vitamin C serum as a part of your skincare routine , it should be applied at alternate times with this formula (ideally Vitamin C in the PM and this formula in the AM). Otherwise, Niacinamide can affect integrity of pure-form Vitamin C.
Infused with willow bark extract, this oil-free serum works wonders at soothing irritation and redness, while clearing any excess sebum or debris clogging your pores. Not only does it help reduce breakouts and inflammation but also contains firming peptides to soften the appearance of fines lines. Not tested on animals. Too old for adult acne, too young for fine lines? Put breakouts behind you, and fight the signs of aging with this silky serum that does double-duty to take years off of your skin! This plant-powered skin treatment contains retinol – the gold standard of anti-aging ingredients—to rev up collagen production and reduce fine lines and discoloration, all without drying out your skin (thanks to glycerin, Hyaluronic acid and vitamin E in the formula). Along with anti-aging retinol, this serum also contains wintergreen-derived salicylic acid to treat and prevent future breakouts. Use it on clean, dry skin every night. Make sure to follow with a light layer of moisturizer, if you have dry or sensitive skin. If are struggling with acne and dry skin like me, this deeply hydrating intensive serum is your best bet! With a heavy-duty boost of hyaluronic acid, the ultra lightweight oil-free formula feeds skin with moisture to keep it supple and flake-free. Not only that, it also feeds your skin with antioxidant vitamin C plus skin-soothing Allantoin to boot! It can be used alone (morning and night) or layered under your moisturizer. Cruelty-free and paraben-free. This feather-light, quick-absorbing formula uses 1% Salicylic Acid to keep clogged pores and breakouts at bay while lycopene helps minimize pesky pores. A blend of Bisabolol and Ginger helps control redness caused by acne, and Witch Hazel helps control oil and sebum production. You can use this as a spot treatment or apply a thin layer all over your face. The 97% natural formula is oil-free and non-comedogenic. 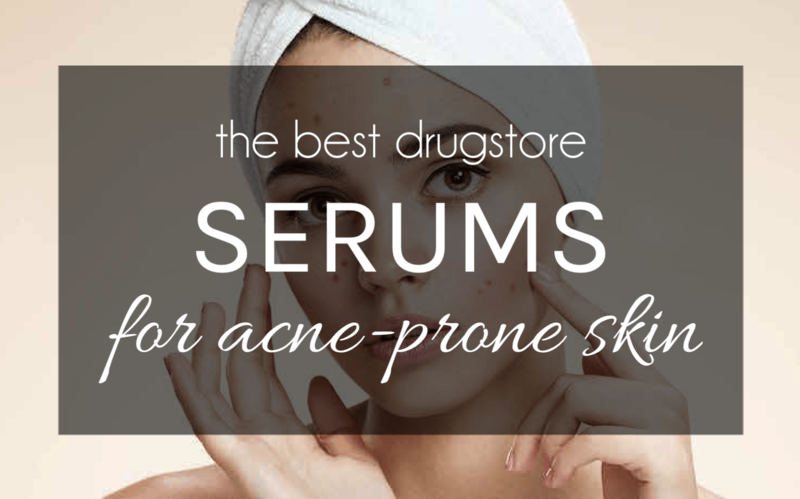 Do you have a favorite drugstore serum that works well for acne-prone skin? Please share it in the comments below!